My life is still pretty chaotic so nothing long and detailed today, but here are some mini reviews of several crime and/or investigator stories I have read recently. Tom Fell, A small-time crime boss, checks himself out of a mental institution (against doctor’s orders) and tries to re-assume leadership of his bookmaking/gambling racket. With Tom’s mental stability in question, a power struggle ensues. Plotwise it’s a fairly typical mob story with the added dimension of the protagonist becoming increasingly manic throughout. That dimension gave it some added interest but didn’t pull it up into the category of the great crime writers like Hammett or Cain. 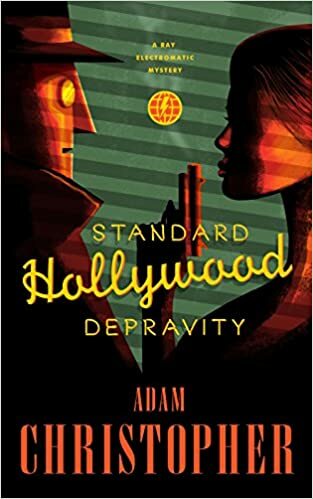 This novella of earth’s last robot, originally a programmed as a private eye but now a hit man in alternate 1960’s LA, fits nicely between the first two books (reviews here and here). In this one, Ray’s violent, morally ambiguous hit man side is more on display than previously. This made him a bit less sympathetic but no less interesting and entertaining. My copy also contained the very first Ray Electromatic short story Brisk Money, but it wasn’t very interesting if you’ve read the other three books since most of it has been recapped at some point. Gail Carson Levine is one of those children’s authors whose works are worth reading as an adult. Her plots are either clever reworkings of classic fairy tales or highly original worlds that are all her own. In this book, a girl trying to apprentice herself to a mansioner (actor) instead finds herself assisting a dragon in investigative work, largely related to the noble, much despised, ogre who owns one of the two castles in Two Castles. The dragon and the ogre are both outsiders with their own quirks and lore. I found the dragon particularly entertaining IT (that is how you must refer to dragons since they do not reveal their gender) is a commoner who makes most of ITs money toasting bread and cheese skewers in the market. IT is a bit capricious and vain but ultimately a good masteress (master + mistress). 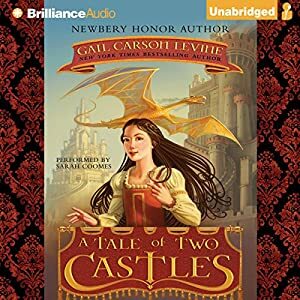 I listened to the audiobook narrated by Sarah Coomes and her voices (especially the dragon’s self-satisfied laugh) added to the enjoyment of the book. Nice! I’ll have to read that one by Christopher. That is quite the range there, from insane mob boss to fairy tale. On an aesthetic side of things, you might want to make your links either italicized or underlined, as they look like regular text in the post. Very easy to accidentally skip over them. Thanks for the tip…the theme I use isn’t always as high-contrast as I would like (one of these days I’m going to have to do some tweaking). I have noticed that most themes seem to want links to blend into the narrative. Not me. I want them to stand out like a sore thumb! A Tale of two castles sounds fantastic! It really is! Levine is probably my daughters’ favorite author, and I’ve really enjoyed the handful of her books that I’ve read.